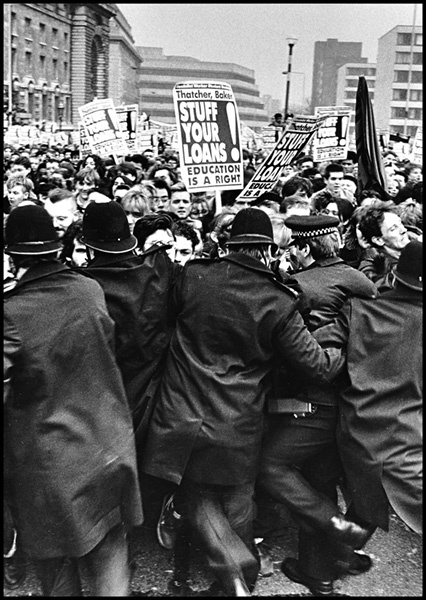 On the day that I got my very first mobile phone I was sent to photograph a student anti-loans demonstration in London. Nobody was expecting anything other than a march by angry students on a very grey day in London. Part of the way through the march there was a large break away group that decided to head for Parliament – which was not on the agreed route. By the time they had broken away and reached the west side of Westminster Bridge the Metropolitan Police already had a cordon across with vans, horses and a large number of officers. Scuffles, charges and fights ensued but the police line held and the students never made it to Parliament – less than 200 metres away. Contrast this photo with the student riots of 2011: the police are wearing no special clothing, no high visibility jackets, no shields and there was no overt photographing or filming of the students either. No buildings were ransacked, damaged or invaded and the whole thing felt relatively civilised. It did feel weird to be able to talk to reporters, other photographers and even the picture desk on the phone in the middle of a mini-riot: my phone was a Motorola 8000s which was known as the “City Brick” because it was so big and bulky. Unfortunately, the story doesn’t have a happy ending (apart from two front pages and a ‘congratulations’ from the editor). A few years before, I had broken a toe playing cricket and during the demo I had the same toe re-broken when a police horse moved backwards and trapped me between it and a van, crushing my toe. As a freelance, I couldn’t afford any time off so I limped from job to job over the following three or four weeks to Christmas. I also had a lens damaged and wasn’t properly insured so my old 35mm f2.8 Nikkor was replaced with a newer 35mm f2. The camera and lens combo here was a Nikon FM with a 35mm f2.8 Nikkor using Kodak Tri-X film.